It’s that transition time of year again. The leaves are changing, the temperatures are dropping, and we’re dusting off our puffy jackets and skis for the winter. Until then, we’ve still got some time in October and November to kill before the snow comes and winter activities abound. There’s always the typical “dinner and a movie” option at the Old Mill Regal Cinemas, our one and only multiplex movie theater, to keep you entertained. On weekends, plan on getting there two hours early to find parking, get a table at Hola, Kona Mix Plate or Red Robin, and hope you get out in time to stand in line for $10 tickets and a $7 bucket of popcorn soaked in butter–assuming your show isn’t sold out by then. But then again, life in Bend is never just “typical.” That’s why we’re highlighting a few alternatives to dinner with a movie instead. 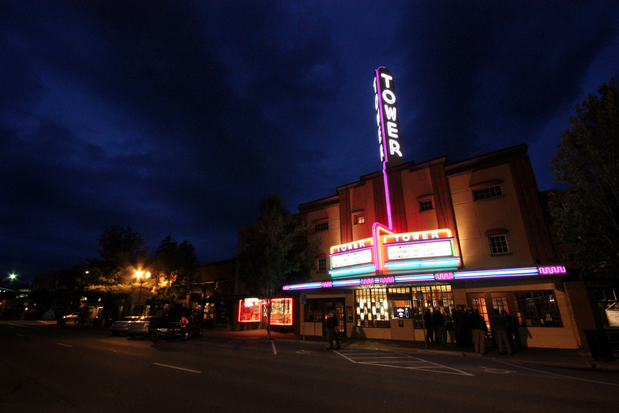 On October 9-12, Bend is transformed from a recreational haven into a small town “possessed by the film industry’s soul.” Downtown and Old Mill theaters, lecture sites, music rooms and party venues spark with celluloid energy as we gather to behold the work of the most talented independent filmmakers. Get your tickets online, then grab a bite at a food cart or one of Bend’s many restaurants beforehand. Since it’s been here almost 20 years, McMenamins is pretty much an old standby for local moviegoers. As a result of its popularity (and cheap $4 admission prices for almost new movies), it requires a pretty standard routine: Arrive at least 45 minutes early on weekends because most of their movies sell out. That gives you plenty of time to order a reasonably priced slice of pizza or a tasty burger with fries or tots, and enjoy them in the comfort of a slightly lumpy old sofa before or during the movie. Along with a refreshing glass of beer or wine, it’s much better and healthier than having a buttery bucket of popcorn be your dinner (or kill your appetite). And surprisingly, it costs about the same. Located in Tin Pan Alley in downtown Bend, this friendly hole in the wall specializes in award-winning documentaries and art films, and delicious microbrews. On Wednesdays, they feature “Spaghetti Westerns” (yep, classic shoot-em-up cowboy movies) with a heaping plate of spaghetti and garlic bread for just $6. They usually don’t tell you what the movie will be. But who cares. It’s a great deal. Volcano only has movies occasionally, in addition to a mixture of live music and plays. But like McMenamins, they have comfy old sofas and chairs, so it’s living-room style. According to their Facebook page, the owner is “quite possibly the coolest dude in town” and the bartender is the “most handsome bearded fella in Bend.” Sold. It’s a bit of a drive from Bend, but it’s in an awesome big red “barn” modeled after agricultural buildings from the Sisters area. What’s cooler than that? The Movie House has a café that serves light meals, beer, and wine along with traditional theatre concessions. They show a diverse selection of films, including feature first-run movies, independent, documentary, foreign, and animated film. Make the most of the great indoors this fall with a new and authentic “dinner and a movie” experience at one (or all) of these great locations. It’s just one of the many unique things that Bend has to offer.